Become Our Channel Partner and Reap the Rewards! Earn Money and Help Others As You Resell CertKiller Products to Your Students, Friends and Colleagues! Explore CertKiller Partnership Program! CertKiller Channel Partner Program aims to share our products while helping you earn. This is a perfect opportunity for training organizations, colleges and companies to earn as much as 30% of our sales. Start your business with ZERO INVESTMENT! No joining fees, sales liability or other hidden catches. 10% discount for customers who use your special "PROMOCODE"
Fill out the application in the bottom of this page and share your marketing plans with us. We'll set up your account and get in touch with you. This is your promotional material which you should distribute among your potential customers. Your promo code gives 10% discount to every customer who uses it. Your code also records every sale to your account. From these sales, you receive 30% commissions. You will receive your commissions at the end of each month. Please note that the first payout will be made after your 10th sale. We use Bankwire, PayPal or Western Union to send you the payment. Please fill out your contact details and requirements below for our CertKiller Partnership Manager to provide you with best solution. 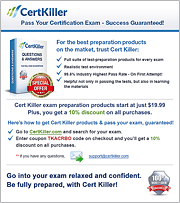 Please provide additional details about your requirements regarding CertKiller Channel Partner Program.